I’m sorry if this isn’t the right forum to post this type of question but I’m new around here so if you can direct me to the right location I would greatly appreciate it! My wife and I moved into a house about 10 years ago that was built in the 1890s and although mostly intact the bedroom as well as a couple of random spots are missing the original trim work. 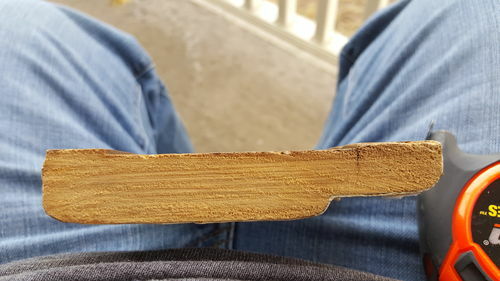 I just recently got into woodworking and although I have some knowledge, I am unsure as to how to remake the design of trim that is in our home. 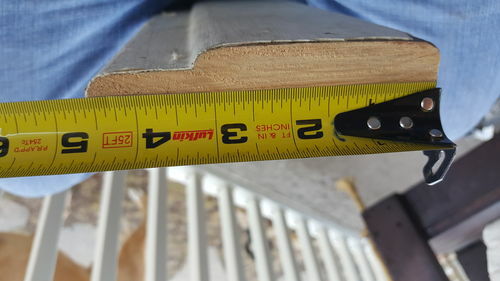 The trim measures roughly 4 and 5/8 wide and round overs on both edges but with the inner Edge having an additional chunk cut out that’s roughly an inch deep. I have taken a number of photos to better relay what the profile looks like, but I can’t seem to find any type of router bit that would cut that actual profile out. Any kind of help is greatly appreciated, and I look forward to seeing your replies! How much of this do you need? 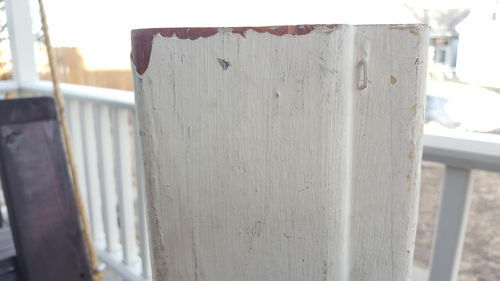 If just a short run or two to match existing trim, I might consider making it with two pieces sandwiched together. Round over profiles on the top edges of the tall and short piece, glue together then round over the bottom edge. pretty, so several passes over a dado head or a wide mortising bit will work. Thank you all for your replies! I think I may consider doing the rabbet cut as suggested, in reply to Ripper, I need roughly 64 ft of this moulding, the molding that was all inside of the bedroom was replaced with a more modern style, and completely mismatches the rest of the entire house! This has three doorways and a window that all need replacing. If I can’t figure it out on the router table, I may just try your idea of butting two pieces together. When I get this project going I will make sure to share my progress! and flat profiles, which complicates it. to tell if they don’t match exactly. recommend you just buy a 4 or 5 piece set. For this limited production and assuming you have a table saw I would suggest finding some molding head cutter sets. Craftsman use to make them and I just check and they are still available inexpensively on eBay. I have made good use of them for this type of a problem. They are high speed steel so if there isn’t one already made you can grind you own shape. You will need to make a custom insert for your saw table and set up some hold downs on the saw to keep the wood in the proper position as you run it through. Don’t try to take off too much wood at a time, make a couple of passes or more and wear ear protection; it can be noisy. Assuming you will use a soft wood like pine of popular this will work quite well. 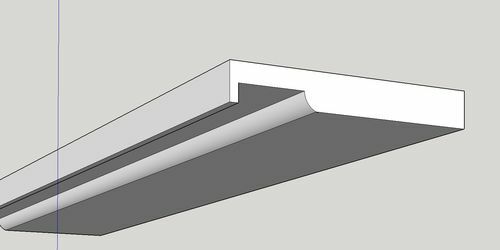 My approach would be to make the step flat and inner round over first and it would help if the board were slightly wider so you have some support on the outside of the step which you can cut off later. For the other two round overs you can use a router with a round over bit. It would be best to use a router table with a fence to control the cut; particularly for the step side which is not tall enough for a bearing guide. There are two different types of shaper heads. One takes only one blade which would make it easier to customize the shape you want from a flat ended cutter. The other takes three cutters so you would need to make all three the same shape or at least close to the same because which ever one stands proud of the others will determine you final cut. Here is a sequence of cuts to make. The last relief cut can be made using a flat cutter in the molder heat. Thank you! That was a very concise post! I appreciate all you put together. LesB, that is a fantastic display of what your process would be. I have no idea t all how to create such pictures with that sort of CAD work. I used the free version of Sketchup to draw the images and with the screen capture feature on my Mac computer I took a picture of each step. On a Mac computer pressing the Shift>Command>4 keys changes the cursor to a “target” type icon. Move it to the upper left corner of the area of the screen you want to create an image of, click and hold then drag diagonally down over the area to the bottom right corner and release the click. That creates a image of just that area of the screen. If you press the Shift>Command>3 keys it created an image of the entire screen without using the mouse. It is a useful feature for extraction just part of the image on the screen. I use all the time to capture images on web pages. After looking at it again I think the same process could be accomplished on a router table. It would probably take successive passes with a straight bit to cut out the step to the proper width. Be sure to use hold downs with those long boards to insure control and even cutting.